This is a guest post by Dr. John Schumann. 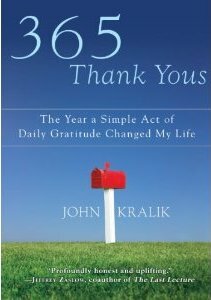 I just read the book “365 Thank Yous” by John Kralik. I heard an interview with the author on NPR and it caught my attention. Kralik had been down on his luck in 2007: Divorced twice, overweight, with a struggling law firm that he’d started, he was also failing in a new romantic relationship. He was worried about losing his seven-year-old daughter, too, in a custody dispute. He made a momentous decision: Instead of feeling sorry for himself (easy to do given his predicaments), he decided to be grateful for what he had. To show it, he vowed to write a thank-you note every day for the next year. What do you think happened? His life changed for the better. His relationship improved. His clients started paying their bills and his firm’s financial footing solidified. His health improved. He eventually achieved his lifelong dream of becoming a judge. To top it off, he turned his personal quest into a writing project. Within minutes of writing a book proposal, he received responses from agents who hoped to shepherd his project. Every writer’s dream.